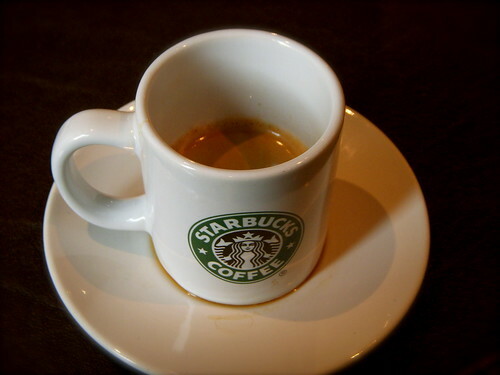 (ii) the idea of preparing espresso style coffee is mentioned a lot in the book where the baristi are trained for many hours on dosing, tamping etc, but in your local Starbucks, the barista just pushes a button – OK ! what’s going on here ? There were a few other discrepancies but I soon found out that the book I was reading was written about the beginning of Starbucks from early 1980’s until the mid 1990’s and that back then, I was reading the book in January 2006 – a 10 year gap. So what happened to the passion of coffee that Starbucks re-invented for North America and parts of the World ? In summary, a lot but as they expanded, the passion suffered. OK ! there was huge success from a financial point of view – yes ! their stocks went way of the scale as well as profits, shop openings and brand recognition, BUT there was a price – quality and romance – the very first ideas that made Starbucks what is was. Anyway, I’m not going to write a whole blog about dissecting what went wrong or right depending from your point of view, but all I can say is that things are expected to change, with the re-appointment of Howard Schultz as CEO of Starbucks (he was previously Chairman of the Board). There’s been a lot of media coverage since mid-2007 when a memo was leaked from Starbucks about the “wrong” sort of changes. In addition, there was a drop in the share price and the first ever fall in sales, culminating with the sacking of their CEO, replaced by Schultz. Now ! Starbucks are trying to “re-invent” themselves again – trying to go back to the original quality ways but trying to take into account the change in environment – I mean now, there are so many Starbucks imitations, as well as cafes that have sub-consciously and blatantly modelled themselves on Starbucks with dim light, brown and green interiors, carpets, etc, who attract customers that want that “away from home but home environment feel”. However, although an estimated 45 million people buy something from Starbucks every week (now, that’s a lot of people) – they have lost a lot of customers, firstly the ones who grew to love coffee from Starbucks and then felt betrayed and started their own cafes or bought their own coffee machines and don’t even dream of drinking coffee outside anymore (sounds like me) and those who just went with the culture thing but once they have found something that tasted like Starbucks and was a lot cheaper, they left for other chains. Regarding the last point, it still shocks me how much Starbucks charge for coffee outside USA – it ain’t cheap in Europe and especially in London. Anway back to what they plan to do. For me, I am looking forward to what they intend to re-launch, especially with (i) grinding beans fresh in the store, and my most anticipated move (ii) preparing coffee the manual way. The whole idea is to bring back the “romance” of coffee – the smell, the preparation and the serving. They’ve also launched an interactive “ideas” forum website on www.mystarbucksidea.com. I wish them luck. For further reading, goggle Starbucks and check the Newsweek article of 21 April 2008. This entry was posted on Thursday, May 8th, 2008 at 9:39 am	and posted in Coffee News. You can follow any responses to this entry through the RSS 2.0 feed.